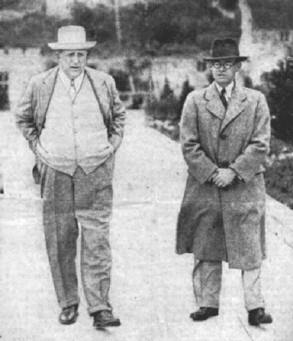 Gareth walking in the grounds of St. Donats Castle, Wales, with the American publishing tycoon, William Randolph Hearst in June 1934. On January 1st 1930, he joined David Lloyd George’s Secretariat as a Foreign Affairs Adviser and it was not until he returned from a visit to Russia in the August of that year that he commenced writing his many articles. These articles are printed on this website in various sections covering the countries that he visited in the course of his short life. Gareth visited Russia and Ukraine on three occasions; firstly in 1930, when he was in Lloyd George’s employ; then in 1931, when he accompanied a young Jack Heinz II of 'ketchup' fame ; and finally it was on his last visit in March 1933, when he internationally exposed the folly of Stalin’s Five-Year Plan of Collectivisation and Industrialisation. This exposure of the Soviet (Ukrainian) Famine (Holodomor) and his subsequent defence of his accusations in response to Soviet denials by Stalin's main apologist, Walter Duranty of the New York Times are covered in this section, along with several supporting documents, including articles by Malcolm Muggeridge. As well as speaking Russian fluently he spoke four other languages including German. He visited Germany twice in 1933 and again in 1934 just after the murder of Dollfuss and the death of President Hindenburg. During his February 1933 visit he flew with Adolph Hitler in his famous Richthofen and attended the Frankfurt Nazi Rally. It was after this flight that he made another very extensive tour of Europe and visited Russia for the final time in the following month of March 1933. Leaving Britain in the May of 1931 he spent a year in the employ of the World's largest Public Relations expert, Dr Ivy Lee, in New York. His article to Dr Lee on the War debts reflect much of Gareth’s knowledge on the world's problems at that time. This and other articles on the United States appear in the above link to America. In the Spring of 1933, after a further short period with David Lloyd George, he joined The Western Mail newspaper and most of his articles were printed by this press. During his time with the paper he visited Ireland, wrote on the Irish problem and interviewed a number of influential politicians including de Valera. In October 26th 1934, Gareth left Britain for a round the ‘World Fact Finding tour’. 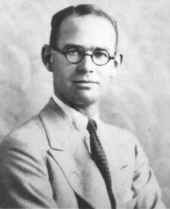 After 10 weeks in the United States he departed from San Francisco for the Far East in order to report on the political situation in the area and investigate Japan’s intention of territorial expansion. His ultimate aim was to write a book, but due his tragic death in the hands of bandits in China on August 12th, 1935 he never achieved his goal. To accomplish his literary ambition he would have referred to these documents. They include articles which he wrote for newspapers (in particular The Western Mail), interview notes which he intended to publish and various other documents of interest to him, eventually sent home as his effects. Gareth wrote a series of articles in May & June 1933, using his international experiences and relating them to the unemployment and poverty in Wales. In June 1933 he was reported on the World Conference (on unemployment) from London. In the summer of 1933, he wrote a delightful series of articles for The Western Mail about rural Wales. Some of these articles were reprinted in a commemorative book: In Search of News published after his death; with the proceeds going towards a Travelling Memorial Scholarship established in his name (which is still awarded today to Welsh students). This compendium of Gareth's articles were first published in the The Western Mail of Cardiff, Wales and then reproduced in a commemorative book In Search of News just after his murder - with all proceeds going towards a on-going travel scholarship in his name and administered at the time by The Western Mail . Finally, there is an isolated article relating to his visit to see Mussolini's Draining of the Pontine Marshes in 1932 entitled: Mussolini has Spoken, plus Vatican versus Mussolini from his German Articles. The 1930s views published in any of the articles by Gareth Jones found from links within this page are not those of the owners of this website and are published for historical & academic purposes only.